It is disheartening to know that travelers visiting Cebu nowadays only consider the city as a stopover. They just spend few hours to sleep or catch a meal before heading to the bus terminals for their destinations. The usual Cebu historical and heritage tour is now gone on every traveler’s itinerary. Palm Grass Hotel, who claims to the be the first heritage hotel in Cebu, tries to bring back the idea of appreciating history and heritage. It was one of the rare moments of getting out of work on an early evening. Arriving at the hotel lobby, the fountain immediately had my attention, cascading waters from clay pots that were used by Cebuanos to carry and store water in the past. A galaner, a bench designed with a storage underneath where several household items and even chickens were usually stored, awaits guests few meters from the glass door. The items really welcome guests and introduce some traditions in the past. Jona waited at the lobby near the Basahanan (library) having various literary books written by local writers. We then approached the front desk to finally check-in after a tiring day at work. “‘Ikatulong Andana’ is the literal translation of ‘third floor'”, Jona continued to introduce the Cebuano language as we disembarked from the elevator. I’m not from Cebu but working in the province for more than two years now, I can say that I’ve already learned some words but still having a hard time conversing in the local language. I’m glad I have friends who regularly teach and talk to me in Cebuano. We checked the number on the doors to find our respective rooms. 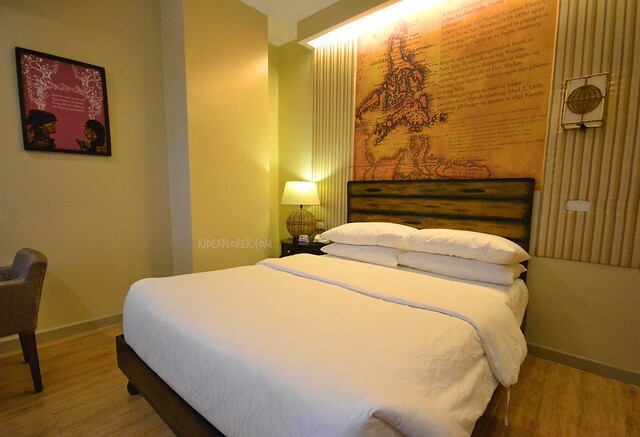 The door opened to a cozy Standard room equipped with a massive double bed, 32-inch LED television, and artworks that depict way of life in the pre-Spanish and Spanish colonial periods in the country. The headboard also has a map with the Philippines outlined. Half of the board describes, in Cebuano, significant persons in the past. Demanding deliverables on work drained our batteries and needed a recharge. After a hot shower, I easily took off to dreamland. The soft pillows and linens accompanied me on my battle against the freezing temperature from the air-conditioning unit. I wasn’t able to track my sleep but it was clear that I had a relaxing sleep during the night. 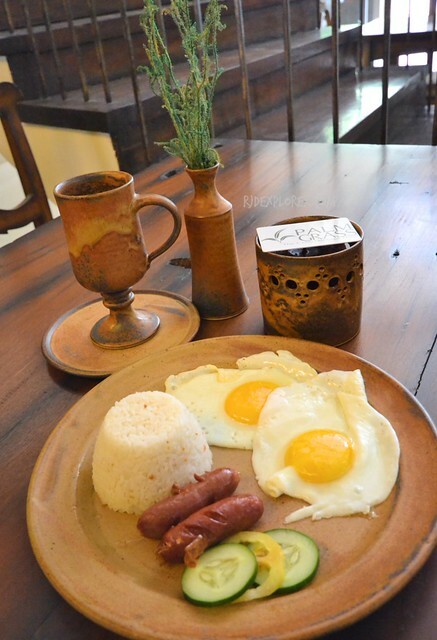 The place is great for some local favorites like longganisa and chorizo meals for the Cebuano breakfast. During our 2-day stay in Palm Grass Hotel, I really appreciated the use of stone wares on serving the food. We found out from the crew that the stone wares are from Mindanao. 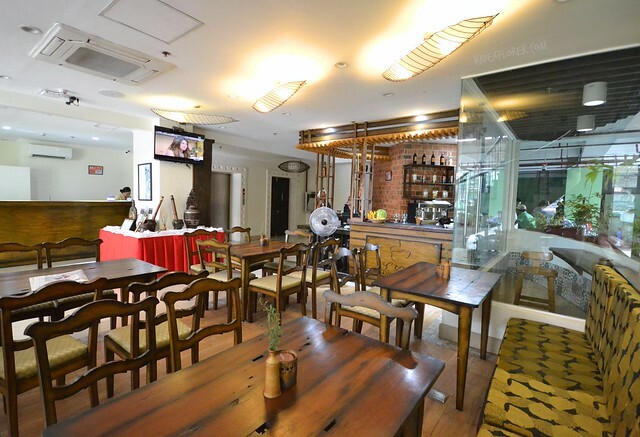 The restaurant also welcomes walk-in guests for their KKK (Pamahaw) Kombinasyong Kaon sa Kapihan that offers variants from chorizo, danggit, tinabal, and tapa. In addition to the restaurant, the hotel offers drinks and cocktails on their roof deck bar offering views of the area. Hardin Dagami serves bar chows from appetizers, sandwiches, pasta, to their specialty such as sinuglaw, humba, larang, and lechon. For mocktails, we saw some mojito, Shirley temple, some fresh juices, and fruit shakes on the menu. Apart from beers and hard liquors, the bar serves tuba (coconut wine), lambanog (coconut liquor), bahalina (aged coconut wine), and passion fruit wine. If you want to shrug off the spirit from your drinks, you can easily plunge on the small dipping pool. Before we left the hotel on our last day, a staff invited us for a simple heritage tour inside the hotel. 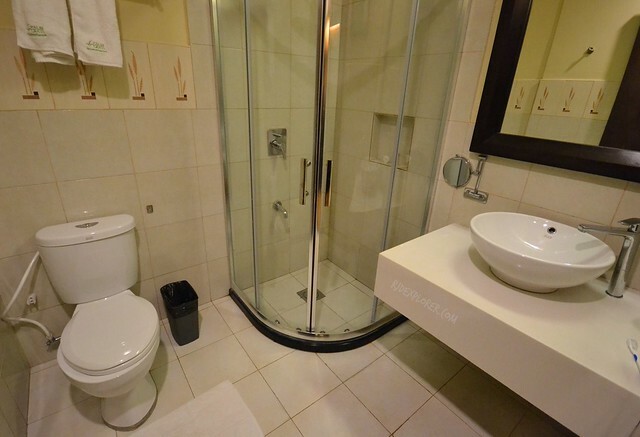 To complete the heritage experience on our stay in Palm Grass Hotel, we complied. We started at the lobby and continued on the second floor. Activities on the lobby on occasions are sungka (native game using carved wood with holes and stones or shells), puso (the famous hanging rice) weaving, and savoring of Cebu delights like binignit, torta, biko, and maruya. 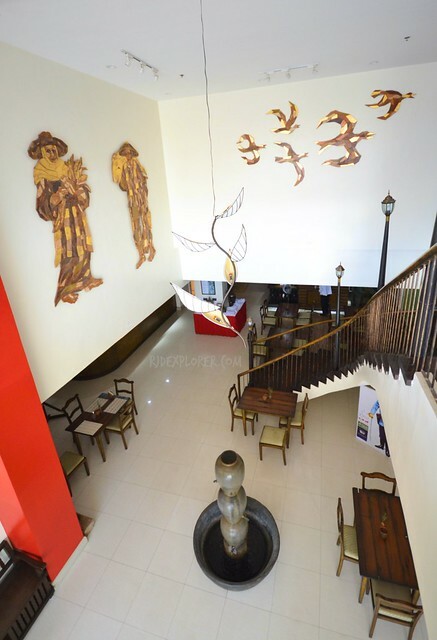 Second floor has the Galeria Independencia that features the different phases of Cebu history: pre-colonial, Spanish era, and 1898 revolution. Joshua Cabrera presented these phases on a timeline. Pre-colonial section showcases weapons, musical instruments, and items related to food and agriculture. Spanish era on the other hand has photos of landmarks in Cebu during the Spanish period. Lastly is the 1898 revolution with an entire wall enumerating over 300 Cebuano Katipuneros who fought during the revolution. The in-house guide even mentioned that the hotel, during its opening, offered discounted rates for guests who have same last names on the wall of heroes. With its location, staying at Palm Grass Hotel will allow you to explore the city’s historical landmarks. 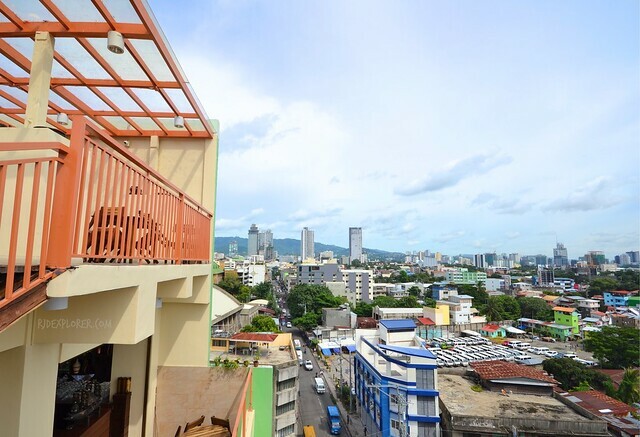 You can start from Casa Gorordo and trace the usual route to Colon and few more blocks to Mactan Shrine. You can check out my previous post for a self-guided walking tour in downtown Cebu. With Palm Grass Hotel aiming to promote awareness of the local history and heritage, I hope the effort will entice travelers to stop by city and marvel on the interesting story of Cebu. On the side of the locals, visiting and staying at the hotel for a short period will be a great exposure on their local history and heritage that they should be proud of. 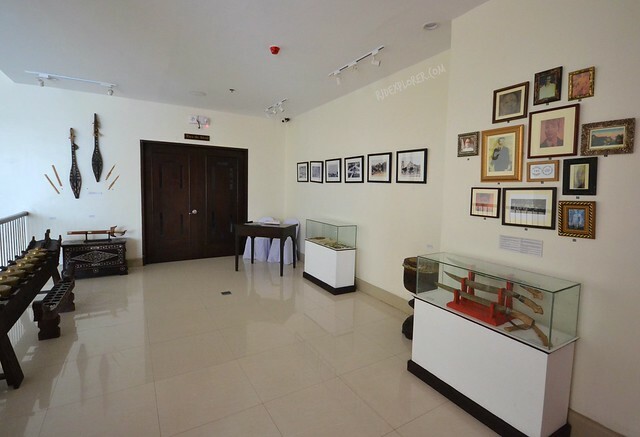 The short stay in Palm Grass Hotel exposed me to some bits of Cebu history that are not widely written in books and other resources when I had my Filipino history classes when I was still studying. 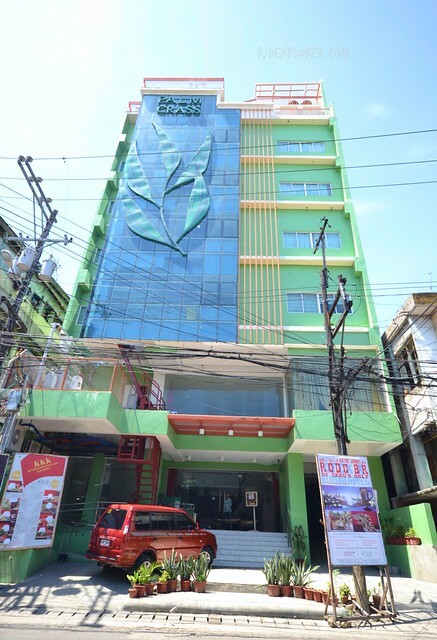 Book your stay in Cebu by clicking on the banner below. Disclosure: Palm Grass Hotel invited us for the sake of reviewing the hotel’s amenities and activities. All opinions stated on this review are my own.